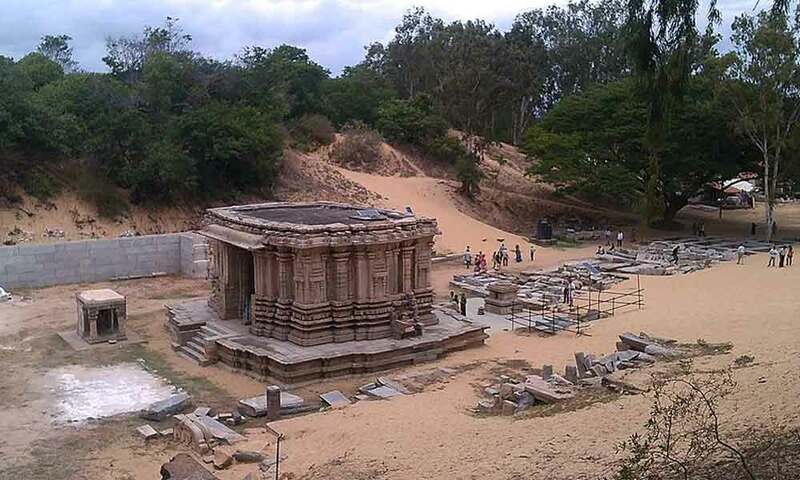 Talakad is a town known for its sand dunes, located near Mysore in Karnataka. A historic site, Talakad once had over 30 temples. It stands at a sharp bend of the Kaveri river eastwards from a southerly course. Sand dunes are formed here persistently, extending over a mile, burying a large number of monuments. Talakad houses the imposing temple to Vaidyeshwara – Shiva. Talakad was patronized by the Western Gangas in the first millennium CE, and then by the Tamil Cholas from the 11th through the 12th centuries. Talakad came under the Hoysala in the 12th century. It was then patronized by the Vijayanagar rulers and the Maharajas of Mysore. The Vaidyeshwara temple is built in the Dravidian style of granite. Much of the structure is here is attributed to the Vijayanagar period (14th century), although several Hoysala features are seen in this temple. The eastern doorway of the Navaranga is beautifully sculptured. Colossal dwarapalakas adorn the entrances. The Vaidyeshsara temple along with four others – Arkeshwara, Vasukishwara or Pataleshwara, Saikateshwara or Maraleshwara and Mallikarjuna constitute the Panchalingams here. These five Lingams are said to represent the five faces of Shiva. The Pataleshwara Shivalingam is said to change colors during the day (red in the morning, black in the afternoon and white in the evening). Panchalinga darshana is a rare pilgrimage occasion, occurring once in every few years. Tradition has it that pilgrims should first bathe in the Gokarna theertham, worship Gokarneswara and Chandikadevi, and then worship Vaidyeshwara, and then bathe in the northern eastern southern and western stretches of the Kaveri and then worship Arkeshwara, Pataleshwara, Maraleshwara and Mallikarjuna, returning to Vaidyeshwara after each worship, finally worship Kirtinarayana and conclude the pilgrimage in one day.